Earlier on Thursday it was brought to my attention that the Veterans of Foreign Wars held its national convention in Indianapolis this week, Aug. 21-26. For those of you who have an historical perspective: If drum corps had stayed under the auspices of the VFW way back in the day, Thursday would likely be the Prelims and Friday night the Finals for the VFW National Championships. It's a fascinating thought: What might the drum corps activity be like if it had stayed with the VFW (and also with the American Legion)? A brief history for those who just came on board: For decades, the VFW and American Legion national conventions were the big shows, each proclaiming its drum corps contests as a national championship. However, many corps didn't go to the national championships every year due to location, as the touring model was different than it is today. Well, in reality, there was no touring model until Jim Jones of the Troopers created one due to his Casper, Wyo. corps having to travel hundreds of miles to get to most competitions. Being that the two organization's national championships moved all around the country, corps that might have been interested in attending had to plan tours to perhaps Seattle, or Miami, or Boston, or Los Angeles. Some corps took passenger trains to the national championships, as there were no other local contests to stop at along the way. (For those who have never seen a passenger train, they were kind of like commuter trains, except they smelled better and served bad food in dining cars.) On occasion, the national conventions were held in Honolulu, which made it just a little difficult for corps to attend by bus or rail travel. There was also this thing about the schedule of these shows. Many of the last years of the drum corps championships at the national conventions were held at the same time as the DCI World Championships, and sometimes a week afterward. Two of the last three VFW National Championships were actually won by feeder corps, Blue Devils B in 1982 and Phantom Regiment Cadets in 1984. The final American Legion Junior Corps National Championship was held in 1980 and was won by the Arbella All-Girl corps. For a few years after Drum Corps International was formed, the veterans' organizations often had different rules than were held to by DCI, creating some interesting problems for DCI corps as some VFW rules were different than American Legion rules. Corps often had to perform an abbreviated show of five minutes in prelims at the national convention contests, and then pull out their long show for the finals. For decades, all music had to be marched at a tempo of 128 to 132 beats-per-minute. Rigorous inspections would knock tenths off a corps' final score for infraction like shoes that weren't polished, buttons that were missing on uniforms, or shakos that were scuffed. When I attended the 1974 VFW National Convention "Million Dollar Pageant of Drums" in Chicago (a bit of a misnomer when one considers the winning corps received a few hundred dollars! ), the corps were not allowed to use their mallet instruments, which had just become legal that year in DCI competitions. That meant some drum solos, written for DCI rules, didn't make much sense. Earlier, the VFW had lifted the ban on timpani after not allowing corps to use the instruments on the field. A couple years later, the VFW adopted full DCI rules, but the downward spiral in attendance of corps was well underway. Ironically, it was in a meeting of corps directors at an American Legion convention in 1971, right in Indianapolis, where Drum Corps International was born. And now the DCI headquarters is in the city, as well as the World Championships. Ahhhhh, the circle of life. For one thing, it would totally mess with corps' season schedules. While this year's VFW National Convention is being held the final week of August, the 2011 convention will held July 21-26, and each of the following two years, it will be held a day earlier. But let's allow ourselves the luxury of contemplating the "What if?" This year's American Legion National Convention is starting August 27. Good luck for the corps finding housing since all the schools will have started classes by then. But for those who couldn't make this year's VFW National Championship and are still interested in hearing drum corps in an enclosed stadium, the Legion's 2012 convention will be held in Indianapolis. Those indoor performances for the corps would no doubt give fans plenty of fodder to express their opinions on the Drum Corps Planet web forum, aka "The Official Voice of VFW and American Legion Drum Corps." Music from seditious sources like "Hair" and "High School Musical 3" would be discouraged in favor of wholesome music from more traditional sources, like acts that appeared on "The Ed Sullivan Show" and "Lawrence Welk." Timpani would be allowed as long as they were carried. Corps would not need an extra truck to carry five full-sized marimbas and four vibraphones. Color guard members would be wearing costumes more appropriate for the pages of a vintage Woolrich catalog as opposed to Victoria's Secret. Blue Devils could perform "Through a Glass, Darkly," but without the mirrors, guard costumes, body sculpturing, crotales, breakneck tempos, speakers, and any percussion techniques developed after 1971. Dancing would be forbidden and it's doubtful hundreds of exuberant WGI marchers could participate in drum corps without serious sedation. 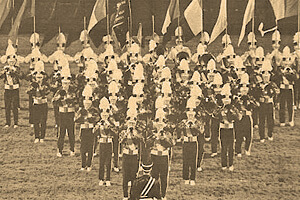 Although it wouldn't be found in print, judges wishing to keep their judging assignments in future years would reward corps for playing recognizable melodies and for marching drills that featured recognizable drill formations that band directors could feverishly copy down on the drawing pads that used to frequently be seen at drum corps shows until 1981. It certainly would be a different world. I'm not saying it would be a better world, as I don't think it would be. Economic factors would dictate that corps directors would be getting together about now to chart a new direction for drum corps, with the result that a consensus candidate from the ranks of drum corps directors would be selected to head the new Drum Corps International. After looking at interested directors from around the country, the new DCI Board of Directors might settle on a quiet soul from the Glassmen named Dan Acheson. Many fans would declare that drum corps was dead or dying, much as they did in the early 1970s. The recession would end—the one thing dependable of recessions is that they always end—and the activity would move forward, setting its own goals and rules. Timpani would be grounded and we would see 10 yards set aside in front of the field for "the pit." Gradually, the pit would continually expand until a field would be set aside behind it. Sizes of some corps would have to be reduced to the new cap of 150. Guards would discover Lycra and a serene recluse named Michael Cesario would buy some additional colored pencils and approach Fred J. Miller with an offer Fred couldn't refuse. Corps would buy or rent additional trucks for equipment and music majors would come out of the practice rooms to discover sunburn and groupies. The DCI World Championships would be held outdoors and some fans would complain that after the comfort of the 2010 VFW and 2012 American Legion National Championships in Lucas Oil Stadium, it would be inhumane and intolerable to be outside at the 2013 VFW National Convention in Reno, Nevada during the waning days of July. The corps would set up an equitable pay schedule for performances, which would be challenged when the American Legion and VFW came back in tandem with an interesting proposal. And of course I, not having any hobbies or drum corps acquaintances, would be featured on the new A&E television show, "Hoarders," attempting to dig out of my reclusive home to 73 cats, all named after Michael Cesario quotes from imaginary television broadcasts that only aired in my head.